Contact me for prices and availablity. 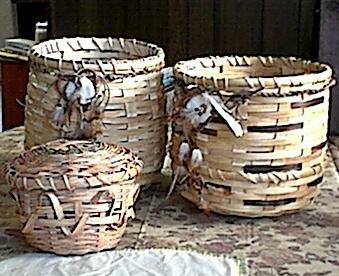 These are two large baskets with dream catcher, and one smaller basket with a lid. The larger ones are 13 inches high and 11 inches across. They are made with ash splint. One is stained with Golden Oak, and the other has three different stains; mahognany, red oak, and golden pecan. Both are finshed with a clear finish. 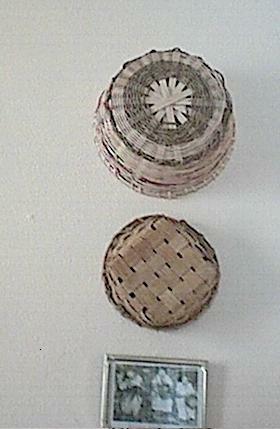 The smaller basket is alidded sewing basket. It stands 8 inches high and 11 inches acrossed the top. It is the first lidded basket that I have done. Below these baskets is a picture of native ladies making baskets. These are also dinner roll baskets. The larger one has pink and green woven into it.